This reproduction glass lamp shade fits Coleman pressure table lamps, made in the 1920s. This lamps were sold under the Coleman and Sunshine Products brand names. The Coleman shade style compliments many non-electric lamps of the era. 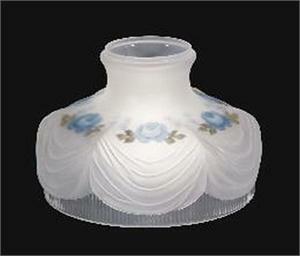 This 10" frosted and clear lamp shade will work with any kerosene, coal oil, or oil lamp that has a 10" shade holder. The frosted and clear combination of this lamp shade allows for good light output while providing a nice warm glow. Beautiful hand painted floral pattern adds elegance to this lamp shade. American Made, Hand Blown Glass. "Coleman's Roses" pattern in blue painted on the inside of the shade. This Coleman lamp shades measures 10" base diameter, with a 10" bulge, and is 7" in height. Please be sure to check out our selection of Antique Lamp replacement parts..